Professional carpet cleaning is also very important for you and your family's health. The carpets are not only going to look great, but also be safe for your kids and pets to play on without any health concerns. Why Heaven's Best Stands Above the Rest? Our exclusive water based cleaning solutions is safe for people, pets, and the environment. They have been engineered to gently remove soil and stains without damaging today's delicate carpet and upholstery fibers. After Heaven's Best Carpet Cleaning cleans your carpet, it will look, smell, and feel great, and also Dry-In-1-Hour! Heaven's Best's Dry-In-One-Hour carpet cleaning removes soil and stains that other cleaners leave behind. First, our powerful dry vacuum system removes the loose soil. Our exclusive cleaning solution then penetrates carpet fibers and gently loosens trapped soil and stains. We'll then gently lift away the soil and moisture with our powerful floor cleaning machine, and specially designed absorbent pads, which clean and dry the carpet. Finally, we'll groom the carpet fibers to look and feel like new. Minimum of 1,000 SQ. FT. 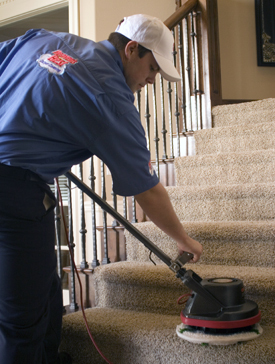 When you choose Heaven's Best Carpet Cleaning we will come to your home on time and professionally dressed. We take pride in making sure ever customer is happy. That's why if the spot comes back, so will we. "Thanks for the great job, Kevin! We feel better about having our 9 month old son crawling on the carpet now." "The carpet looks great, thanks a million for all your hard work. I will be sure to recommend you to everyone!" "We are very happy with the job that Kevin is doing for our two companies, the carpets always look great." "Just got my carpets cleaned by Heaven's Best and I am extremely satisfied. Carpets look fabulous and operator was really nice and professional. Thanks!!!"